Not only used to hold feature plants Large Garden Pots and Planters are also used to add scale to the garden as a design feature in themselves. With new lightweight pots and planters now available it is possible to find larger types and styles that will fit in well with any garden, patio or landscape design. The New Fibreglass Garden or GRC Pots have the advantage of being light and easier to move than some traditional types of large pots. Pots used in gardens serve two main purposes, the functional purpose of holding a plant, and then secondly a landscaping, decorative or architectural purpose. It is for the second purpose that many large garden pots or large planters are used. Bigger Pots also have the advantage of allowing plants to grow with a cooler root zone as larger pots heat up less rapidly than smaller pots. Be aware of weight when installing or shifting larger garden pots and planters. A large pot or planter plus potting soil plus plant can weigh a considerable amount. GRC or Lightweight 'Fibre glass reinforced concrete' is an increasingly popular material for the manufacture of large planters and pots. 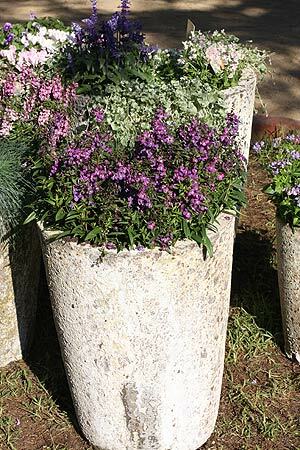 GRC combines strength and lightweight, two desirable characteristics for larger garden pots. It is possible to find bigger sized pots and planters in a range of materials including traditional terra cotta, timber lined with planter liners, metal and aluminium. Consider the style and effect of any large planter in relationship to the overall style of the garden or courtyard. 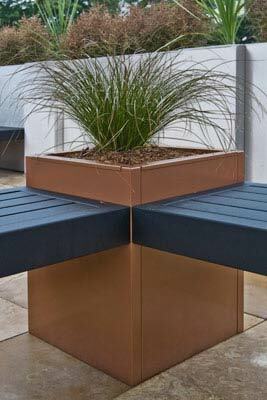 Custom made planters including coloured fibreglass, are available from some manufactures. M.Lennon supplies Garden Pots to small and medium sized Nurseries and Garden Centres eager to outdo the big warehouses. In the one shipment we can supply glazed, terracotta, Hi Fired, Sandblasted, Painted, Terrazzo, Fibreglass pots and water features.